A promisingly catchy Stoner debut from the drums and bass of Seattle duo Year Of The Cobra. Drum'n'bass, anyone? Literally, that is, rather than some sort of Dubstep Doom: those are the instruments of choice wielded by Year Of The Cobra, aka husband and wife duo Jon and Amy - the latter also handling the vocals. 'The Black Sun' is their debut, initially self-produced, EP release, thus far only available as a download, briefly on tape and limited CD pressing; due shortly is a 10" vinyl version through DHU//Devils Child/Heavy Metal Vomit Party. I'm listening to the CD edition, presented in a simple cardfold sleeve that unfussily just offers a few production credits. First off, those are well-deserved. If you're going to go down a minimalist and percussion-based route, it'll need some punch and clarity to get the message across, both of which are present and correct. You get every note and beat with a crisp, uncluttered distinctness that fills the soundstage far more completely than might be expected from a mere two instruments, giving a great launching point for a focus on Amy's vocal delivery. So, pretty much spot-on with the recording, mixing and mastering. For a first outing, 'The Black Sun' shows a lot of promise. I couldn't describe it as groundbreaking originality in terms of musical direction, and it is somewhat on the brief side for forming a fully-balanced judgement, but the carefully thought-out "less-is-more" execution achieves quite a lot in the presentation stakes. It's catchy, direct and free of unnecessary frippery, and - with a vibrant, almost 'studio jam' feel coming through - Year Of The Cobra clearly enjoyed making it. Can't really ask for much more than that from a band, and I recommend both taking a listen and keeping an ear out for the full-length scheduled for sometime this year. 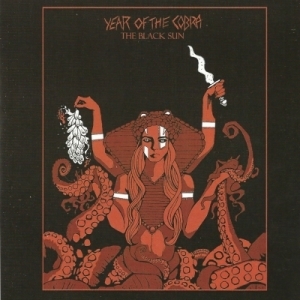 Visit the Year Of The Cobra bandpage.